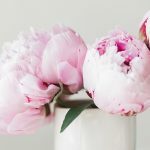 When it comes to organic beauty, we, girls, are lucky. 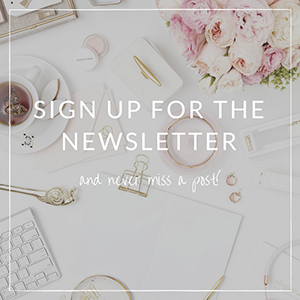 There are hundreds of products to choose from that have all the right ingredients and lovely scents and, of course, works well. There are not that many products formulated specifically for men, though. Sure, many beauty products are suitable for both sexes, but men also need things like face shaving creams or aftershave lotions. Also, not all ingredients are equally suitable for men and women (let’s say, some essential oils). 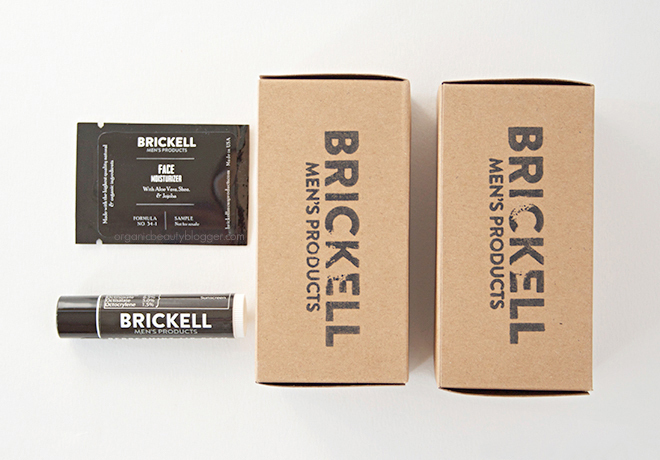 I could go on about this for hours, but I’ll stop and introduce you to Brickell Men’s Products. This is a relatively new organic skincare brand from the US, formulated for our men. 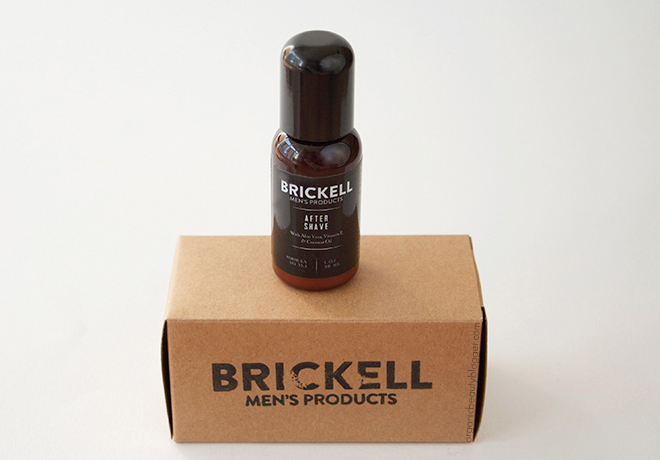 Brickell creates its products not only with the finest organic oils and extracts but also presents them in a modern (and recyclable!) packaging. A thick, rich shave cream with a neutral scent. The Shave Cream is packed with highly moisturizing cacao butter, shea butter, castor seed oil, and jojoba seed oil to keep the skin nourished and ensure safe shaving without any cuts and nicks. The cream also contains a small amount of lavender distillate and aloe vera juice to maintain skin calm and hydrated. Aloe Barbadensis* (Aloe Leaf Juice), Cocos Nucifera* (Coconut Oil), Butyrospermum Parkii* (Shea), Ricinus Communis (Castor Seed Oil), Calendula Officinalis* (Calendula Extract, Emulsifying Wax, Stearic Acid, Glycerin, Theobroma Cacao (Cocoa) Butter, Lavandula Angustifolia* (Lavender Distillate), Vaccinium Myrtillus* (Bilberry Fruit Extract), Saccharum Officinarum* (Sugar Cane), Citrus Aurantium Dulcis* (Orange Peel Extract), Citrus Medica Limonum* (Lemon Peel Extract), Vaccinium Macrocarpon* (Cranberry Fruit Extract), Acer Saccharinum* (Sugar Maple Extract), Ananas Comosus* (Pineapple Fruit Extract), Carica Papaya* (Papaya Fruit Extract), Carica Papaya* (Papaya Leaf Extract), Glycolic Acid, Malic Acid, Tocopherol (Vitamin E), Tartaric Acid, Olea Europea* (Olive Oil), Simmondsia Chinensis* (Organic Jojoba Seed Oil). *Certified Organic. An extremely light, but nourishing After-Shave Lotion, formulated without alcohol. Instead, it contains calendula, hyaluronic acid, and bilberry fruit extract. These ingredients repair and calm the skin after shaving. The Aftershave also has a neutral scent. My husband is enjoying this one a lot. Aloe Barbadensis* (Aloe Leaf Juice), Calendula Officinalis* (Calendula Extract), Vaccinium Myrtillus* (Bilberry Fruit Extract), Saccharum Officinarum* (Sugar Cane Extract), Cocos Nucifera* (Coconut Oil), Emulsifying Wax, Glycerin, Lavandula Angustifolia* (Lavender), Acer Saccharinum* (Sugar Maple), Citrus Auranium Dulcis* (Orange Peel Extract), Citrus Medica Limonum* (Lemon Peel Extract), Methylsulfonylmethane (MSM), Dimethylaminoethanol (DMAE), Vaccinium Macrocarpon* (Cranberry Fruit Extract), Stearic Acid, Simmondsia Chinensis* (Jojoba Oil), Tocopherol (Vitamin E), Sodium Hyaluronate (Hyaluronic Acid), Lecithin, Xanthan Gum, Glycolic Acid, Tartaric Acid, Malic Acid. *Certified Organic. A lip balm with soothing organic calendula and coconut oil, which gives moisture to dry, chapped lips. The lip balm contains an SPF 15. 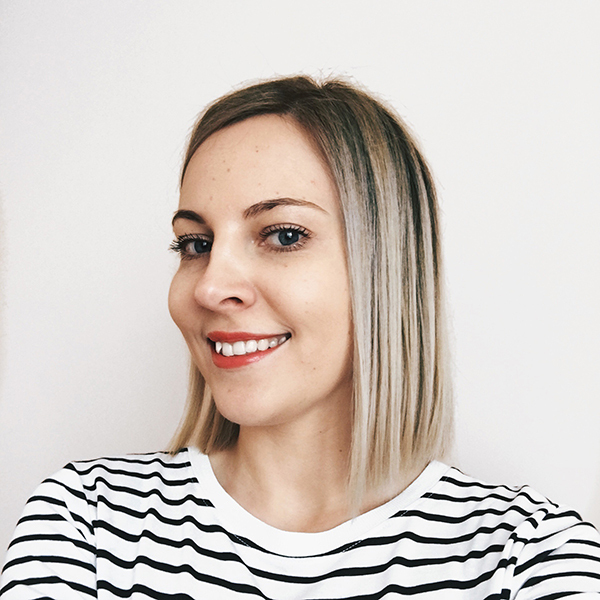 However, I would prefer that it would come from mineral filters instead of chemical filters (mineral filters protect skin by deflecting or blocking the UV rays while chemical filters protect by absorbing them). 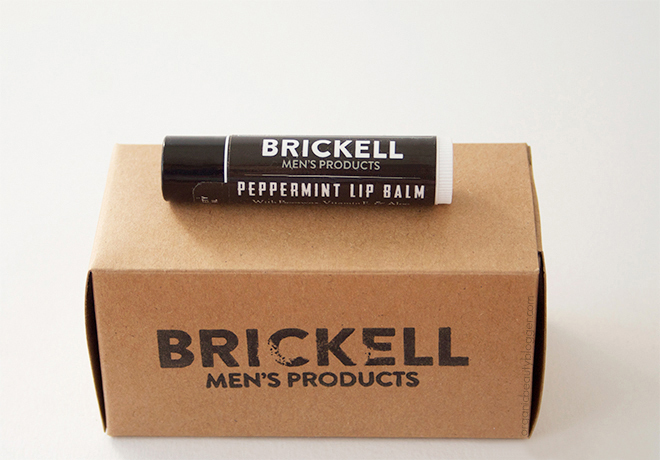 The lip balm has a strong, but pleasant peppermint scent. The best part is the no shine finish. Sunflower Seed Oil*, Coconut Oil*, Beeswax*, Essential Oil Mint*, Vitamin E, Rosemary Extract*, Calendula*. SPF Active Ingredients: Octinoxate, Oxybenzone. *Certified Organic. 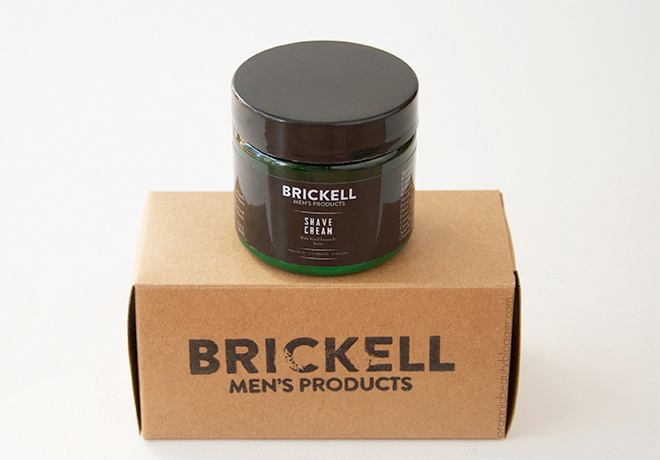 What do you think about these products from Brickell? Yay! Paul hates when I buy him girly things, might have to get him these for Christmas! My Dad was also really impressed by that aftershave! Which is close to a miracle, because he never likes stuff I give him to try.